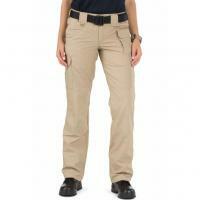 The Women's Taclite® Pro Pant from 5.11 Tactical follows a traditional cargo pant design, but is made from an innovative polyester/cotton, ripstop fabric blend that is lightweight and breathable. Its HT Teflon® finish helps to resist wear from active use in the outdoors or on the job. Designed to sit comfortably at the natural waist, the pants include a self-adjusting waistband and gusseted crotch to preserve a full range of motion. Thigh cargo pockets with a magazine/cellphone pocket on the left side, a knife pocket mounted on the right front and rear slash pockets offer ample storage space of everyday items. The Taclite® Pro also includes a rear web strap for secure attachment of accessories. Great pants. The sizing is right, they're comfortable, and durable.